microsoft has no other items for sale. 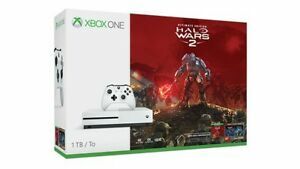 The Microsoft Xbox One S game system with Halo Wars is a bundle that includes the popular game Halo Wars with a Microsoft Xbox One S. This white console is a region-free analogue video with 1TB of hard drive capacity. The hardware includes a wireless controller and included with the Xbox One hardware bundle. Sales tax may apply when shipping to: AL(4.0%), AZ(5.85%), AR*(6.5%), CA(7.5%), CO*(2.9%), CT*(6.35%), DC*(5.75%), FL(6.0%), GA*(4.0%), HI*(4.166%), ID(6.0%), IL*(6.25%), IN*(7.0%), IA*, KS*(6.15%), KY*(6.0%), LA*(4.0%), ME(5.5%), MD(6.0%), MA(6.25%), MI*(6.0%), MN*, MS*(7.0%), MO*(4.225%), NE*(5.5%), NV(6.85%), NJ*(7.0%), NM*(5.125%), NY*(4.0%), NC*(4.75%), ND*(5.0%), OH*(5.75%), OK(4.5%), PA*(6.0%), RI*(7.0%), SC*(6.0%), SD*(4.0%), TN*(7.0%), TX*(6.25%), UT(4.7%), VT*(6.0%), VA(5.3%), WA*, WV*(6.0%), WI*(5.0%), WY(4.0%). Fast shipping, items came as described. Thanks! Arrived quick, though given the item, I could have asked for more packing. Really good deal with an extra controller and Halo game. Delivered in lot less time than expected. My grandson says as of 12-28-2107 everything is working. The graphics are a lot better than the 360.